Al Jazeera verdict: With the Middle East falling apart, is the U.S. giving up on Egyptian democracy? Can the U.S. Still Afford to Push for Egyptian Democracy? 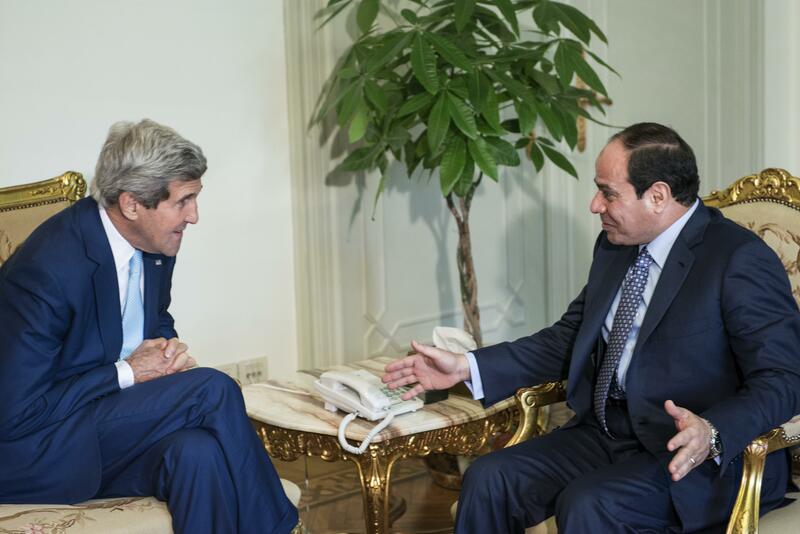 Kerry and Sisi talk before a meeting at the Presidential Palace in Cairo on June 22, 2014. The timing is, admittedly, unfortunate. Yesterday, Secretary of State John Kerry visited Cairo to announce that the Obama administration is ready to normalize relations with the Egyptian government, likely meaning a full restoration of military aid and the resumption of a suspended shipment of Apache helicopters. The aid was originally suspended last fall in response to the government’s harsh crackdown on supporters of the Muslim Brotherhood. Even before today’s verdict, nothing had really happened since then to suggest Egypt has earned its way out of the doghouse. The crackdown on the Brothers has continued, and May’s election was widely seen as a farce. The trial of the journalists was a particularly bizarre affair: Evidence that the reporters were slandering the nation and aiding extremists included a Gotye song and a video of trotting horses that was originally shown on an entirely different network. It certainly seems like what’s changed here is not the policies of Abdel Fattah el-Sisi’s government but American priorities elsewhere in the Middle East. Iraq is on the verge of national collapse, Israeli-Palestinian tensions are again reaching the boiling point, and Libya is seemingly consigned to dangerous instability for the foreseeable future. Stable-ish pro-American governments with competent militaries are in short supply in the region right now. My guess is that, with Sisi’s message now clearly sent to foreign correspondents in Egypt that they’re not immune to the government crackdown, the Al-Jazeera reporters won’t actually serve their sentences. But beyond this particular case, it’s clear that concerns about the country’s democracy have, once again, has been moved to the backburner.